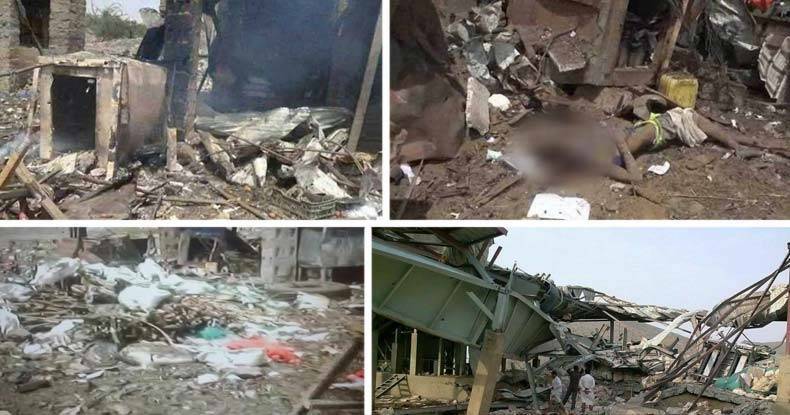 Hajjah Province, Yemen — Tragic reports are now flooding out of Yemen’s Hajjah Province after Saudi warplanes launched a massive missile strike on a crowded marketplace, leaving anywhere from 40 to 107 innocent civilians dead so far. Yemen’s al-Masirah TV reported on Tuesday that a busy restaurant adjacent to the al-Khamis market was also targeted in the airstrikes. Original reports of the market strike noted that over 40 civilians have been killed and that number continues to rise. Saudi Arabia started its aggression in Yemen during March of last year to supposedly bring former president and Riyadh’s ally, Abd Rabbuh Mansur Hadi, back to power. Civilians are suffering a “terrible toll” in the fighting tearing Yemen apart, with casualties now topping 8,100, nearly 2,800 of them killed, many of whom are children, amid Saudi-led coalition airstrikes, shelling by Houthi groups and other clashes, the United Nations reports. Saudi airstrikes have also taken a heavy toll on the already impoverished country’s infrastructure, destroying many reservoirs, hospitals, schools, and factories, reports Press TV. Amnesty International said on Monday that the kingdom’s has led a “devastating” campaign of “unlawful” air strikes and bombardment of civilian targets in Yemen, according to the Independent. “Thousands have died. Many more have been injured and displaced. Yemen is now in a humanitarian crisis,” they added. The US remains completely silent on the war crimes of the Saudis while they continue to ship them massive amounts of arms. However, the murderous rampage in Yemen being conducted by Saudi Arabia and their US-backed coalition forces are becoming harder to deny.